In some spiritual traditions, particularly Christian and Islamic, there is a strong emphasis on the heart. Both traditions have slightly different viewpoints, but both agree on the heart being an organ that has a huge influence upon us and others; modern science has seen that it possesses a large electromagnetic field. It is also known as the heart chaka or plexus, and is mediated by the sympathetic-vagal mechanisms that alter the hearts function on a day-to-day, moment-to-moment balance. Christianity introduces us to the Heart of Love, the huge and wide prophetic heart of Christ, as a ruh or Holy Life Force. Likewise Islamic mysticim would tell us that we need to develop the heart as a spiritual organ, and that there is both an outer heart (Arabic : qalb) and an inner one. For us to develop our heart we need to be (instinctual) attentive–an instinctual / animal quality that helps us to (material) notice (when something is different, polarized, switched off), and then to be (vegetal) aware of what field or sensory state we are in or surrounded by. When we are attentive to the power of this field or element which has switched Love off, or turned it towards something lesser, we then should be mindful–that is, try to understand the narrative we are in at that moment. We then have the opportunity as humans to surrender to the Divine, presenting our immediate state and thus allow the Highest Love to clean our small yet very important organ that transmits Love to and through our whole self, to all those that we meet and have a relationship with. The heart sits metaphorically between our various elements–material, vegetal, animal and human–and acts variously as a bridge, pacifier, toner and instrument to slowly take us away from our binary state of, for example, our emotions, to a centered trinity, where the purified element of this (particular) heart lifts us up from the mere mortal, binary, volatile nature of, again the example, our emotional life; to a heart that is still, deep, wide and pure (e.g. the heart of water). return towards Love itself. So like a seed it wants to geminate, to rise up, to move away from its history. It contains the potential of emergence–towards Love itself. In this way, as the heart is purified by our attentiveness, and then surrendered to resolve, relieve, absolve our historical patterns concerning basic or historically nuanced love, the heart emerges upwards, towards a greater Love. It then acts a fulcrum above the elements that it corresponds to, and acts like a balance to stop us from falling back down towards our history and old narratives. During our life our heart may become tempered and shaped. This may take years; but we may slowly develop a heart that goes through the five stages of growth. The second stage from that which is cold, stern, walled-in and protected is the heart of a teenager – an emotional and soppy heart, one that is often drowned in emotion and feeling. This is known as the heart of water. This heart has the fortune to wash the heart below, the one of earth, cleaning the heart in emotion and feelings. It is often unstable, as, like a lake blown by turbulent winds can be choppy and dangerous. It can, as we develop this watery heart become emotionally unstable, or deeply emotional which can sometimes drown its owner or the lover in its empathetic or emotional love. However, as in the narrative of the heart of earth, through our attentiveness and subsequent surrender to Love itself, this watery developing heart eventually gives way to a heart that is deep, full, wide, quiet, pure and nourishing. It rises and falls, and has an inherent rhythm bigger than our ordinary rhythms and cadences. It is susceptible to the Greater Life (like the pull of the moon) and pulls us up into balance so that we are not swayed by errent emotion or feelings. It contains innocence, purity and has huge width encompassing the whole of humankind. It heralds the birth of compassion. In many spiritual cultures the act of purification–ritual baths, fasting, preparation for prayer (Arabic : wudu)–act as the initial act that begins the mental preparation to purify our heart from errant love. As the teenager moves into adulthood and marriage or stable partnership the heart can also, albeit slowly, morph into its next developmental phase. This is the heart of air, which is characterized by our instinctual driven heart that is less emotional, more light and easy. It allows insults and negative influences move past it like stalks of grain or grass, allowing the wind to ruffle through it. It is less reactive, easy in love, has absence or light heartedness to caring and is less self centered. Its achilles heel is in its lightness, and carelessness, because it too can easily be drawn by the winds of change, the perfume of another. Its lightness can take the person into promiscuousness or other relationships. It is fickle, and like the winds, change or alter in temperament, be forceful and stormy, or easy and light on the touch. You can envisage it like a ballon rising up, and if we let the balloon go, then the heart would simple be free. Then the winds of fate will take it; it will be drawn to what ever (attractive or seductive) force is present at that time. So we, as humans, must keep hold of the string on the heart (balloon- full of air), and allow this heart to teach us, mentor us in our behavior in love, and then to prompt us to surrender these various stereotypes that we hold so that our heart truly becomes light, adventurous, pure, full, easy and lifts us up into a higher station away from instinct, lust and carnal behavior, or power, shame, vice, fickleness or abuse. This heart is like an outstretched arm that is raised in salute, raised to receive something new, a heart that is held aloft heralding a larger role. It is the heart that initiates the Prometheus within, to dare to rise up and steal the fire. 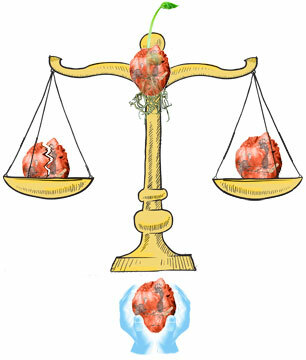 As it lifts us up, we become balanced from these fickle power plays in love and allows us to be carried by Divine Love. We can grow through this fickleness, this ease and lightness, and find passion, oration, fire and light in a heart consumed by fire. 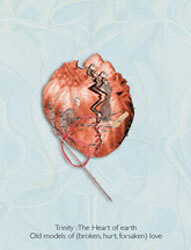 This heart of fire personalizes the human heart. It is the torch bearer in essence, and as it develops through growth, we can initially scald, temper, burn, cast a shadow, light the way. This heart of fire initially acts through a Promethean narrative–for we often, like him, steal from Zeus (the gods), and we must be careful not to bring to earth and our human life all the old pains and narratives and to utilze this heart in the wrong way. We must be conscious that our passionate fiery heart can mislead, can hide the shadow by being so bright, can mesmerize and bring false hope. This heart first ought to cast light upon our old stories that we still carry as wounds and cauterize them. This fire will start out fueled by human passions, and slowly as we surrender these passions–pride, greed, impatience, arrogance and spiritual hubris–then this heart becomes fueled by Love itself. It is then we can truly light the way and serve as a beacon of hope. As we take on and review, reflect and allow both life and surrender to change our various states of love, we become aware of our heart’s progress. One can guage the state we are in, by how we react or how we get stuck in an emotional or habitual or arrogant place. Even though we cannnot change this, we can realise that this is where we are–”here I am , as I am”. In so doing we can offer up our heart and our state to the Creator. Once our heart has shifted station, then the ontological moment occurs, as we look down at where we have been. This is much harder to write about because the writer cannot, in all conscious, describe authentically this heart. We can say this is heart that belongs to God. This is a heart that is purified. This is heart that is unconditional. It is offers the human to be in the flow of Love, be with Love and guided by Love. It is a state of Grace. It comes not from our effort but through total submission (rather than surrender) to the Absolute–Love. Earth – holds the imprint, and remembers all that is done to it; the heart of culture and the old; (the footprint in the sand)–the heart that remembers the hurts and wounds of the past. The heart that wants to emerge. Water – is unsettled by the forces of nature, it often is in vacillation (yin or yang) and in its functional dynamic, slowly comes back to ease; this is the heart of feeling, and emotion. It can clean our feelings, wash our history away, but can also drown self or others in emotion. This heart wants to grow and come alive in its inner feeling through finding innocence, peace, purity, quietness, depth, fullness in Love. Air – moves with any force, bends with it, and then settles back; this is the heart of instinct and passion, it can be unsettled, light and easy and fly off to land on another; so it can be a heart that is promiscous. This heart wants to lift us up from old stereotypes, wants to teach and be an example. It brings lightness and an otherworldliness (lifts us off our feet) to our heart reminding us of other realities and a greater Love. Fire – burns and scorches the insult or emotion that comes towards it, and can be too hot to handle or cause a blister or two! This is the heart of a human, and provides us with the fire of love to help others be fired up by a common enthusiasm. This heart makes us the bringer of knowledge, or the light of knowledge. This Love that does not hurt but transforms. LOVE – changes the moment before it occurs, changing hate to love; the heart of nobility. This is the Christos – the heart of the Christ, unconditional, beneficent, uncompromising, forgiving, all consuming. The Light (Nur) of Mohammed; The Light of the Prophets.